360 Getting Renamed? Or is it the Next Xbox? A picture showed up at the doorstep of your favorite CAGCast, suggesting that the Xbox 360 was in for a name change. Other news sites have picked up the story, suggesting that it may be the code name for the “Next” Xbox, others think it could be the revised name for the New Xbox Experience. Remember, when it was announced, it was hailed as the first time a console would essentially relaunch itself, entirely through software. Why not give it a new name, when you do? 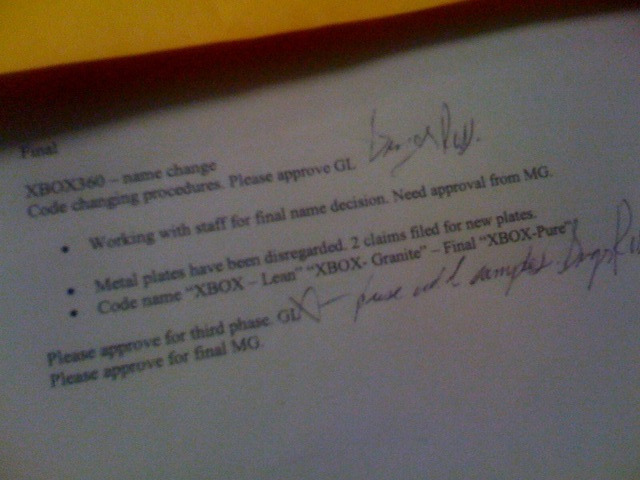 The memo does note something about “metal plates” – an easy way to cover one name up with another. And calling this one “Xbox Pure” may alleviate the console naming and numbering scheme down the line (we’ve all heard 720 and all of that jazz…). Still, I’m more inclined to agree that it’s a working name for the next generation of hardware. We’ve all grown fond of the new Xbox Experience – if they really wanted to brand it as an entirely new thing, they would’ve been hyping up that name long before now. I’m sure the discussion is well under way at sites like CAG, so rather than asking what you think, I’d say go join the discussion over there! Think of this as a PSA, helping to spread the word, and let’s thank places like CAG for being able to uncover some of the things they do! Posted in GamingTagged xbox 360, Xbox PureLeave a Comment on 360 Getting Renamed? Or is it the Next Xbox?